At times, nostalgia is one of the biggest drivers in life. From that favored TV show, to the memories you may have with family or friends. It's those moments that keep us going, and their the moments we are able to look back on in times of need. The Power Rangers are that nostalgia for me, especially the memories I have because of that amazing show. I have a large forearm tattoo of the Power Rangers famous lightning bolt. Now some folks see it and think that I was insane to get it, however, others know that almost all of my tattoos have meaning, and are very, very nerd oriented. My Power Rangers tattoo though, has a secret meaning. You see, in the corners of the design I have initials in it, they are my Grandma's initials. When my brother and I were younger she and my Aunt took us to see “Power Rangers Live” at Universal Studios. It was a blast. And even though my grandma did not quite get the appeal of what we were watching, she smiled and loved it because we loved it. My grandmother was diagnosed a few years ago with Dementia, and unfortunately, she is in the last stages of it right now. She doesn’t remember most of us, and is pretty much a shell of the woman we all knew and loved. This isn’t me shilling stuff for the sake of it, this is me saying if Power Rangers bring back great memories, go ahead and take a look below at their press release below, check out their website, and most importantly, check out Power Morphicon. Have some fun, and relive some of those memories, I know I will. With special Day 0 Thursday Even Added! The Power Morphicon Convention is celebrating its SIXTH show, the expo’s first at the Anaheim Convention Center in Anaheim, California. The show is run by veteran convention artist and vendor Scott Zillner who annually puts on nearly a dozen shows in the Los Angeles and Sacramento areas including Japan World Heroes, a convention celebrating Japanese and Sentai related popular culture. Power Morphicon Convention has been held every other year since 2007, and Scott Zillner has been in control of the show since its second run in 2010. Since then, Power Morphicon Convention has been held consistently on even-numbered years. Power Morphicon Convention hosts the largest number of actors and crew from the Power Rangers franchise, including artists and actors from the original Japanese Super Sentai series, upon which the Power Rangers television show is based. In addition to meeting their favorite actors from Power Rangers, fans and convention attendees will be able to purchase some convention exclusive merchandise. These special convention-only items are available for pre-order with your paid convention membership (attending or non-attending), or at the expo during the show. Items include the exclusive Lord Drakkon figurine (throne sold separately) and the black and gold Megazord Funko Pop! figurine. 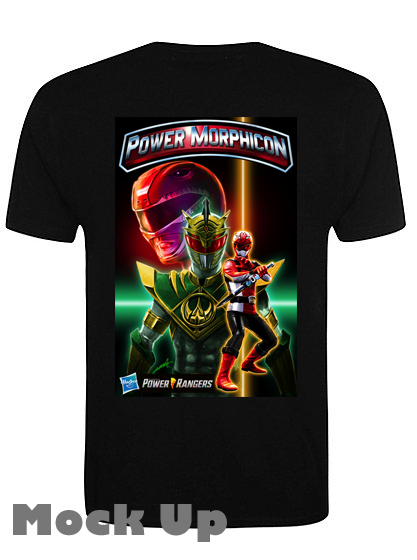 A convention-exclusive Power Morphicon Convention T-shirt is available for purchase, as well as metal Morphin’ Coins and specialized merchandise for Membership Tier. *All product images courtesy of Power Morphicon.